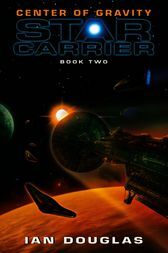 Center of Gravity is the second book in the explosive Star Carrier series by Ian Douglas—and a breathtaking new high in military sf, the strongest of the science fiction subgenres. Battlestar Galactica fans will adore this saga of ultimate war in deep space, as humankind risks its very future, battling a vast alien evil empire in order to achieve transcendence and become a major power in the universe. Douglas’s Center of Gravity belongs on every action-lover’s sf bookshelf—right between Joe Haldeman’s The Forever War and Heinlein’s Starship Troopers.